TACKY | Pro Chem, Inc. 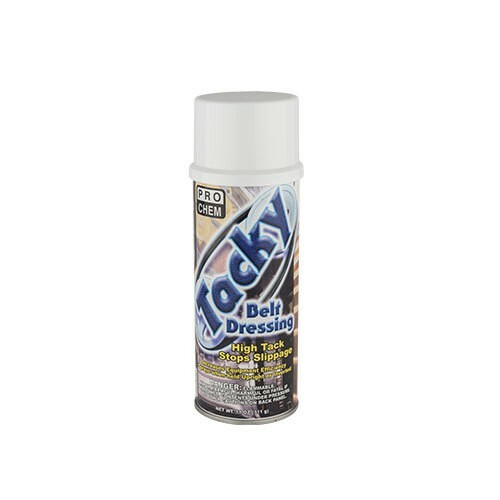 Prevent belt slippage and keep equipment running at top performance with this handy aerosol spray. TACKY is formulated with several liquid resins that provide the necessary adhesion belts need to firmly grip sheaves and pulleys. While it is extremely tacky, it will not glaze and can be used on a variety of materials, including rubber, leather, fabric and synthetics. Resists water wash-off and performs effectively under wet conditions. NOTE: In many instances protective guards must be removed in order to apply belt dressing properly. In such cases, please use extreme care to prevent accidents. Be sure to replace guards after treatment. Apply a little at a time to inner surface of belt while machinery is in motion. Spray using a back and forth motion until the surface is completely wet. On most belts, the spray may be applied to the sheaves, pulleys or directly onto the belt itself. Repeat occasionally to maintain full power and optimize belt life.